Spend enough time with a web designer and you’ll hear strong opinions about the best way to approach ‘UX’. The importance of user experience is indisputable. At its most primitive web design is all about helping the end user to find the information that they are looking for. However, web designers inevitably disagree about the extend to which UX should be prioritised. Most successful web designers encourage clients to choose integrated, consistent website designs with strong branding features throughout the website. This helps to avoid clutter and mess, and gives the site visitors a clear sense of what the website is trying to communicate. In fact, there are few worse website design misdemeanours than inconsistent branding. However, some of the world’s biggest, best and most effective websites have distinctive web design features within their website. In other words, they have disregarded some of the fundamental rules of website design. A great example of this in the UK is the BBC’s website design. The site is hugely accessible, serving a hugely diverse demography, and clearly caters to a vast audience. In many ways the BBC website is the epitome of a UX-led web design; functionality is treasured extremely highly. However, whilst there is some consistency, each section of the site has its own unique features. If you contrast iPlayer with BBC Sport, or News with CBBC, you’ll notice that these are essentially web designs within a web design. This presents us with a web design challenge; do we work within our existing industry rules and convictions, or do we follow the lead of websites which have audiences of millions? Paul Boag confronts this precise challenge in his recent article. I’ve got mixed feelings about it. The UX (user experience) part of me is going, “Everything has to be consistent! People have to find their way around the site!” But the marketeer part of me is thinking if different users are interacting with different parts of the site, and those users are different enough, the messaging and how we approach them has to change. Whilst not every business has the diversity of the BBC, it may be that you are facing a similar question with your web design. There are, of course, a number of alternatives. You might wish to employ a Landing/Splash page as the starting point of your web design. 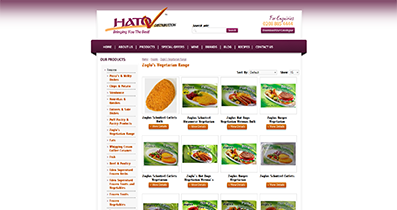 This allows site visitors to choose which products or services they wish to explore. Another option is to shape the web design around the unique branding features of the company’s primary products/services. However, this might be seen to limit the effectiveness of the marketing of other areas of the business. If you’re feeling ambitious, you might opt to design your way out of trouble, employing distinctive photo, video or colour to distinguish between different components of the (otherwise largely consistent) web design. If you’re looking for a better way to communicate with your audience, why not get in touch with one the UK’s leading web design companies? We’re constantly looking for better ways to help our clients find creative solutions to their website design challenges as they seek to strengthen their business.